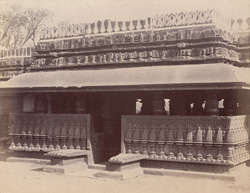 Photograph of one of the entrance porches of the open mandapa of the temple at Kundgol taken by Henry Cousens in the 1880s. Kundgol is situated in what was called the Dharwar district of Karnataka when this photograph was taken. In the Bombay list Kundgol is described as being 20 miles south-east of Dharwad: "...A fine old temple, more within the limits of Par than Kundgol; it is built without lime, of highly polished stones, which are dovetailed into one another. The carvings and images on the pillars are well cut, but have been injured by Muhammadans. It was repaired by a former chief in 1808-9, and dedicated to Shiva and Parvati.'' Although damaged, the exterior of the temple is decorated with lotus and kirtimukha faces and apparently 'hundreds' of Brahmanical images.